Appreciate sweeping countryside and Little Traverse Bay vistas from one of the last lots available. Lake view building site in a suitable location. Close and easy drive to Petoskey, Harbor Springs and the Inland Lakes. Seller has done lots of preliminary with building site and septic area approve. 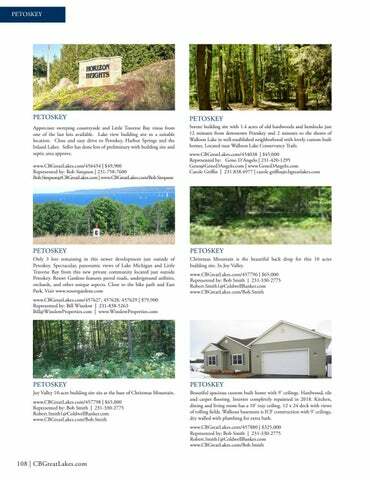 Serene building site with 1.4 acres of old hardwoods and hemlocks just 12 minutes from downtown Petoskey and 2 minutes to the shores of Walloon Lake in well-established neighborhood with lovely custom built homes. Located near Walloon Lake Conservancy Trails. Joy Valley 10-acre building site sits at the base of Christmas Mountain. Beautiful spacious custom built home with 9’ ceilings. Hardwood, tile and carpet flooring. Interior completely repainted in 2018. Kitchen, dining and living room has a 10’ tray ceiling. 12 x 24 deck with views of rolling fields. Walkout basement is ICF construction with 9’ ceilings, dry walled with plumbing for extra bath.